From the moment we entered the The Kitchen Table Restaurant in Mountain View, California, it was obvious that we were going to have a special experience. Our first impression was correct. The Kitchen Table is located on “restaurant row” in the small town of Mountain View, California — in the heart of Silicon Valley. It is just a few miles from Palo Alto, and within a 40-minute drive of San Francisco. Upon entering the restaurant, we were greeted by a welcoming staff, contemporary, creative decor and an innovative, but moderately priced menu. Only nine months old, the restaurant is an exceptional artisanal, upscale eating destination; one that focuses on fresh, California seasonal, made-from-scratch food, and is kosher certified by the VAAD Hakashrus of Northern California. We ventured in for lunch on a Friday. Our goal was to taste many of the restaurant’s specialties. We managed to accomplish our goal. We tasteda traditional chicken and matzoh ball soup; the vegetables were crisp, the matzoh balls delicious and the chicken plentiful. Next came the unique “piece de resistance” Koshuterie Plate, complete with a variety of smoked meats including pastrami, salami, lamb “bacon”, and duck “ham” alongside a pablano pepper — all prepared, cured and smoked in-house. The lamb “bacon” and the duck “ham” were extraordinarily delicious and the pastrami, which is their most popular lunch item, was irresistible! Yes, we asked, but no, they do not yet ship! Next we sampled both a Portabella Mushroom Burger, and a hamburger. Shall we say that we stopped there? No, we couldn’t — we absolutely devoured our fresh, hot sweet potato fries. So, who runs the day to day operations of the restaurant… and how did this restaurant come to be? Our conversation began with the restaurant’s talented manager, Steven Long. Steven has impeccably delicious credentials... Before coming to The Kitchen Table, he worked on the famed Google campus in its catering facility — supplying food to Google’s employees along with founders Larry Page and Sergey Brin (Larry especially loved his food!). Steven also taught at the San Francisco Culinary Academy and still occasionally works as a private chef for several VIP clients including Henry Kissinger, Gerald Ford, Shirley Temple, and more. On Thanksgiving he prepared a deep fried turkey for Nancy Pelosi’s family! Steven explained that he has a passion for cooking and that the added challenge of using kosher ingredients was intriguing to him. These were two motivations for him to join The Kitchen Table, which currently is northern California’s only upscale kosher restaurant. Chef Jay Vigilla is the chef de cuisine, the master behind the house cured meats, aged steaks, smoked fish, home made pita, and all of the in house specialties! According to Chef Jay, since the restaurant is located in northern California, he also has access to fresh, superb produce. Now to the second question… how did the restaurant come to be? The answer lies in the vision of its majority owner, Silicon Valley entrepreneur and founder of Ariba, Bobby Lent and a group of investors he assembled. Together, they planned the launch of an exceptional restaurant, one focused on excellence in quality and service, and which “incidentally” would be glatt kosher. By opening The Kitchen Table restaurant, Bobby, who is well known for his philanthropy in the Jewish Community, has presented an upscale and kosher eating venue for those who appreciate fine food. We wish him well! 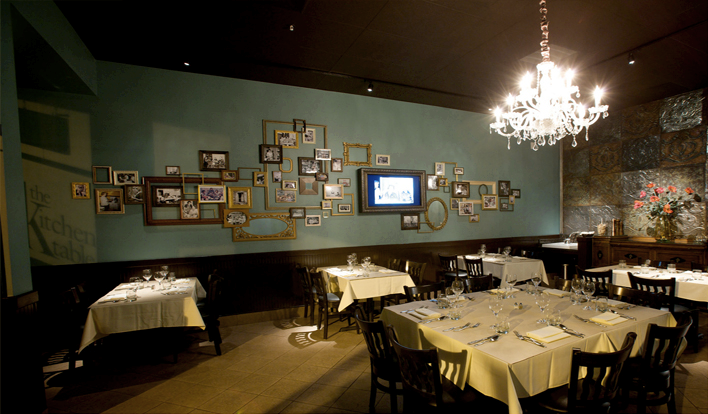 By the way, if you go (and you simply must if you are in the San Francisco area), in addition to the freshly made food, enjoy the restaurant design and wall décor… all selected by the owners’ wives. A large digital picture frame is mounted prominently on a frame filled wall (quite appropriate for Silicon Valley), and it is both entertaining and nostalgic as it continually shows old photos of multi-generational families sitting at their kitchen tables. You can send them your family photo too! The new spring menu can be viewed at www.thekitchentablerestaurant.com. In addition to lunch, the Kitchen Table is open for dinner, and also for Sunday brunch. Reservations are accepted. Shabbat takeout and Corporate catering available. The restaurnat is certified Glatt Kosher by the VAAD Hakashrus of Northern California.